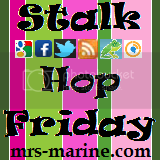 Welcome to my New "Stalk Hop Friday"! It's hosted at: Mrs. Marine and the Tiny Troops, Novel Bloggers, Two Peas in a Pie, and Aspergian Tales! This one is a little different from the usual, instead of just following on Google Friend Connect (GFC), each week the "Follow Theme" will rotate to something different! There will be two linky's each week, one for the Theme and one for GFC! So everyone has a chance to participate! **Hop around the Links ("Stalk" each other) Follow others, Follow Back, have fun! Link to your Twitter account below! 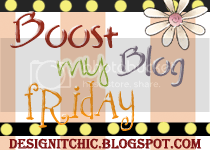 Link directly to your Blog post about "Stalk Hop Friday" or Friday Follow below! **Please grab the Badge to put in your post, help spread the word and make this hop big!! Note: It's a lot easier for others to leave a comment and follow you back if they have a specific post to comment on. Visiting from the blog hop. I'm lovin' your blog here! Glad I found you! I am a new follower. Thanks for the blog hop! A new follower from Hop Along Friday...happy weekend. Ok - I want to follow, but I can't find your google friend connect link on your blog. ok, so even something as simple as a blog hop and wine shouldn't be combined! I mistakenly added my blog to the twitter one... sorry. Darn it so much for me appearing intelligent. I am a new follower! Hope you visit me at http://teensntoddlers.blogspot.com/ and if you choose to follow... Fab! A new follower from the bloghop. Would love to have you on board, thanks! Following you from the Friday hops! I hope you stop back by and follow too. Please be sure to leave a comment letting me know if you do. Happy Friday! Following you now :) Coming from Fun Follow Friday! Now following you from Fun Follow Friday! Just found you on the blog hops and I've mistakenly linked my blog into the Twitter links - if you want to delete it I understand. Really sorry for that. Have a great Friday and a blessed weekend! New follower! hope you have a happy Friday! Stalk hop is now permanently placed on my blog's hop page. Have a great weekend. Hugs! Hey! I'm a new follower from Follow Along Friday. Hope you will stop by my blog and return the follow! Hi there! New follower here from Friday Blog Hop. Love the blog! Drop by and see me if you get the chance! 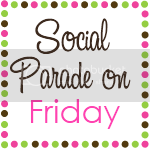 GFC follower from Friday blog hop. Hi there! Nice blog you have and I'm following from Friday Follow new Friends. Hi! 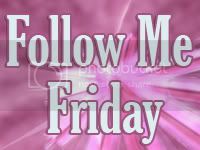 Following you from Fun Follow Friday on Simply Stacie! Hi! 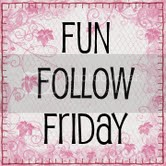 Following you from Fun Follow Friday! Please check us out and follow back if you like our blog also. I am your newest follower from a blog hop! !